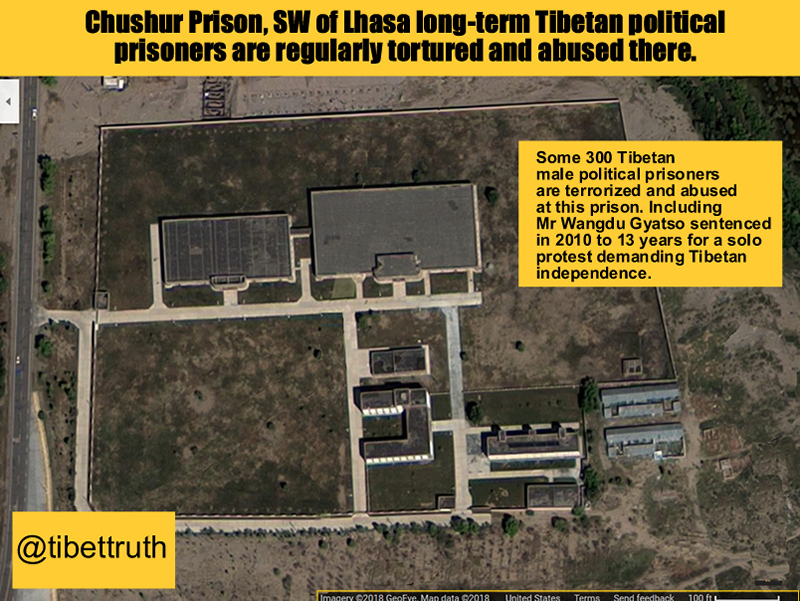 Situated in the north eastern outskirts of Lhasa, Drapchi is the largest prison in Tibet, although there are many more, some concealed by titles such as ‘re-education centers’ or ‘reform through labor camps’. 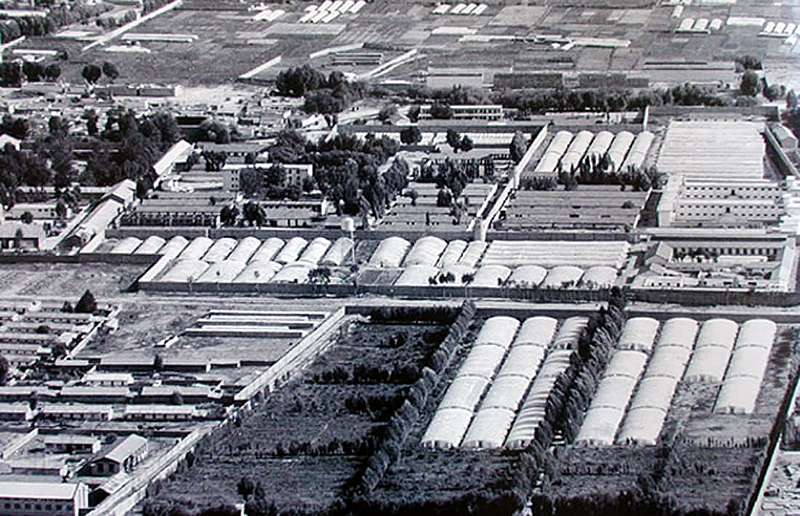 Opened in 1965 and built with forced labor it is known in Chinese as Di Yi Jianyu-No 1. Prison. The prison is arranged into a series of nine units and has recently been expanded and restructured. It has an estimated population of 1000 of which some 600 are thought to be political prisoners ranging in age from 18 to 85. Most of these are monks and nuns. Conditions inside are harsh with a brutalizing regime of forced labor, systematic torture, poor diet, and constant brainwashing programs. Detailed reports of torture have been well documented by human rights groups including Amnesty International and Asia Watch. Alarming cases of forcible blood and human organ extractions have also been documented by independent monitors (two Chinese nationals were detained by the FBI whilst seeking to trade human organs in the United States). Yet despite the appalling conditions and suffering endured by Tibetans Drapchi has become an inspiring symbol of resistance and the struggle for independence due to the heroic actions of political prisoners. There have been several demonstrations within the prison. The last major incident took place on 1st May 1998 during which eleven Tibetans lost their lives. Chinese troops opened fire at protesters who refused to take part in a propaganda film being made for a visiting EU delegation, which was due to visit the next day! Other events have brought the plight of inmates to the attention of the outside world, such as the pro-independence songs secretly recorded by Tibetan nuns and smuggled out. A further protest erupted during a visit by the United Nations Working Group on Arbitrary Detention on 11th October 1997. Those prisoners involved had their sentence increased by five years and suffered torture and solitary confinement. It is a matter of great shame that the Working Group failed to even mention the incident in their report to the United Nations. Subscribers of Tibettruth have been campaigning on behalf of Tibetan political prisoners and those efforts have been welcomed and praised by former inmates, who reported such actions as offering real encouragement and hope to Tibetans. The campaign has also served a warning to the Chinese authorities that organizations are monitoring the plight of particular prisoners and of general conditions. ‘I appeal on behalf of Mr Wangdu Gyatso , a Tibetan political prisoner, who was arrested by the Chinese paramilitary August 2009. According to a September 16, 2010, Tibet Post report he staged a solo protest in Chamdo calling for Tibetan independence and the Dalai Lama’s return. On September 8, 2010, the s0-called Changdu Intermediate People’s Court is reported to have sentenced Wangdu to 13 years in prison on an unidentified criminal charge. The situation in occupied Tibet concerning the nature and extent of China’s oppression and atrocities is well documented. The disturbing circumstances that prevail has been carefully recorded and continues to carefully monitored and assessed. The illegal occupation and imprisoning of citizens who are now prisoners, should all be released, and Tibet given back their rights and Independence. May all the humble political prisoners who are fighting for our nation be released and may the truth conquer the dark. Bless you for what you are doing here.